De peste 170 de ani, mărcile P&G şi angajaţii noştri au influenţat şi îmbunătăţit calitatea vieţii consumatorilor din întreaga lume, oferindu-le produse de calitate şi valoare superioare. Acest angajament se aplică şi investiţiilor noastre la nivel social. Angajaţii şi mărcile noastre reprezintă cele mai preţioase bunuri ale Companiei şi, împreună, aceştia exercită o forţă extraordinară care poate produce asupra celorlalţi un impact semnificativ. Every year, 59,000 people die from maternal and neonatal tetanus—a completely preventable disease. So for the fourth year running, Pampers is teaming up with UNICEF to deliver the vaccines that vulnerable women and their children need. The effort gets our consumers involved. With the purchase of one pack of Pampers, one dose of the vaccine is donated. Our campaign has created the highest awareness ever for maternal and neonatal tetanus, helping put the disease back on the agenda of health authorities. 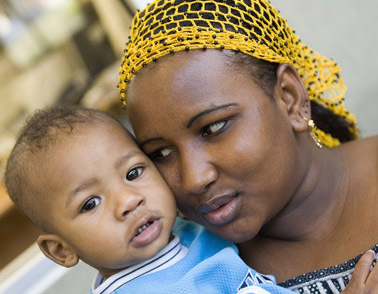 Since 2006, a total of 100 million women and their babies have been protected against maternal and neonatal tetanus. P&G Commits to Save One Live Every Hour P&G has committed to save one life every hour in the developing world by delivering more than 2 billion liters of clean drinking water every year by 2020, helping save an estimated 10,000 lives and preventing 80 million days of diarrheal illness on an annual basis. 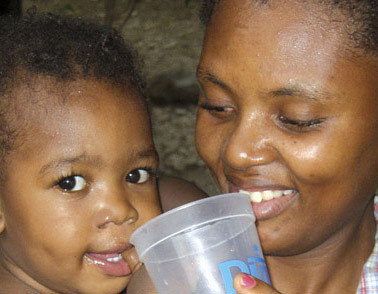 Program reaches these people through PUR packets, a water purifying technology developed by P&G and the U.S. Centers for Disease Control and Prevention (CDC). One small PUR packet quickly turns 10 liters of dirty, potentially deadly water into clean, drinkable water. The packets can be used anywhere in the world, including areas affected by natural disaster. India has the world’s largest population of uneducated children, with nearly half of all children there not attending school. The Shiksha program (Shiksha - Hindu for "Education") is dedicated to fighting that trend, helping to provide access to education for more children. 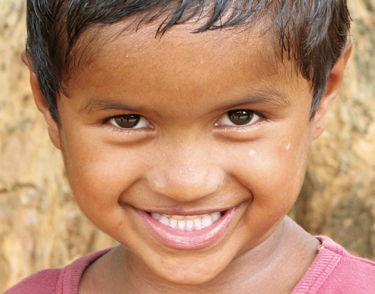 In India, over half of all children don’t attend school, especially in small villages. But the Shiksha program, sponsored by P&G, gives children there the education and confidence they deserve. More then 100,000 children have been reached by this program in the last 5 years. "Chance to life, chance to new memories"
"Chance to life, chance to new memories" – a cause related campaign which has started in 2008 in Romania with focus on raising awareness to vulnerable groups of children, and to the issues they are facing in the very early stage of their lives. Yearly, in Romania,1,000 children are born with some sort of heart malfunctions, and 20,000 babies are born pre-maturely. Most of those children can be saved if they get high-tech surgery. In 2008, campaign focused on heart malfunction problems. The collected money was used for equipping specialized surgery room in Targu-Mures hospital. In 2009 campaign continued with the same cause and helped equip a surgery section at “Marie Curie” Children Hospital in Bucharest. 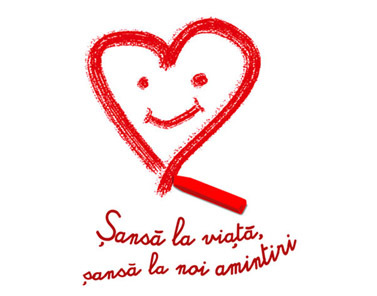 The 2010 campaign collected funds for the 14 high-frequency ventilators for 11 maternity hospitals in Romania to care for a large number of premature babies. "Chance to life, chance to new memories" in Bulgaria - a cause related campaign conducted in 2009 in Bulgaria with aim of increasing awareness to the large number of premature born children. The average statistic shows around 10.5% premature children are born annually in Bulgaria, in some regions the figure getting up to 19%. 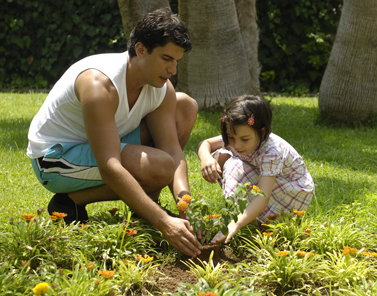 Estimations indicate around 6000 premature born children/year. Half of them have respiratory problems. The campaign raised fund for 40 Neopuffs (respiratory devices for premature born children) which were donated to 40 hospitals. The great recognition came in form of award from the Forum of Bulgarian Business Leaders (BBLF). 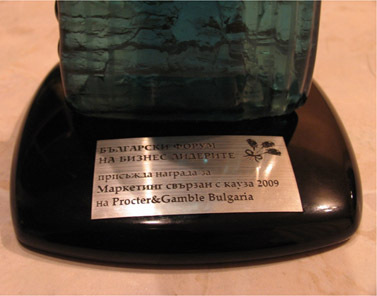 P&G Bulgaria received BBLF first award in the category “cause marketing” for the Charity project 2009. Campaign continued in 2010 aiming to further help premature born children via donating 42 Pulse Oximeters to Bulgarian hospitals. These devices help monitor health status of premature born children. 2010 edition of the campaign was again rewarded by BBLF with second award in “cause marketing” category. The program started in 2002 with main goal to initiate a pro-active attitude of young generation towards local communities in Romania The program targets pupils from 6th and 7th grades and it was developed in partnership with UNDP, Ministry of Education and Youth and under the patronage of the President of Romania office. The program involved directly more than 25.300 children from 165 schools from Bucharest and other main cities (Timisoara, Iasi, Cluj, Brasov). The program trained children and their teachers to prepare project proposals related to the improvement of lives in local communities. Around 300 project proposals were received and 59 have been financed and implemented . Through the preparing project proposals and later through its implementation, children and their teachers had the opportunity to learn how to change their local communities to better. Pentru mai mult de 170 de ani, mărcile şi oamenii P&G au atins şi au îmbunătăţit viaţa consumatorilor. Acest angajament se extinde şi asupra investiţiilor noastre sociale. Oamenii şi mărcile noastre sunt activul nostru cel mai de preţ şi, împreună, sunt o forţă extraordinară, cu un impact care contează.